When I was still young and beautiful, that is in 1980s, schoolkids in Estonia had their own newspaper, called 'Säde' or 'Spark'. I even have vague memories of attending their young correspondents’ school, where we were taught how to write newspaper articles. As it happened, I never became a journalist after all. The few pieces I’ve written for newspapers are outnumbered by academic articles, and I’m not sure how helpful my early journalism masterclasses have been. I made them again a short while ago. Cannot really give a recipe, as it uses a special pancake mixture from Estonia (flour, sugar, milk powder, whey powder, baking soda, citric acid, salt, egg powder) and I have no clue what would be the equivalent brand abroad. 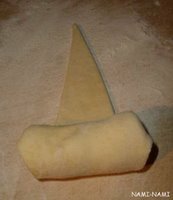 But you mix 500 ml of pancake mixture, 250 grams of butter and 250 grams of ricotta or quark into a dough, and after resting in a fridge, you divide it into 3, roll each into a thin circle and divide into 16 sectors. 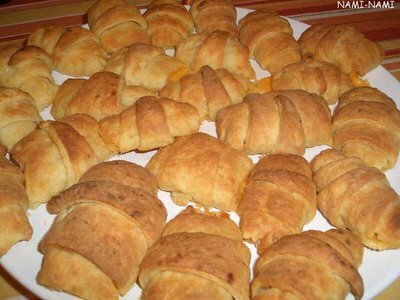 You then put a piece of cheese onto the wider end and roll each into a small crescent. And then bake them golden in the oven. I like the way how the cheese disappears into the thin air, sorry, into the surrounding dough (as well as escaping the pastries, of course) (look at the last picture here to see what I mean). 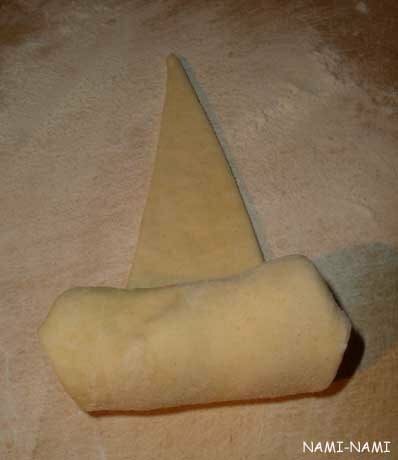 In the USA I made something similar using a ready made dough mix made by Pillsbury. Does the pancake mix come in a see-through plastic bag or paper bag? Shauna - thank you:) I'll be missing lots of yummy Edinburgh places back home, but then I'm also looking forward to frequenting all the amazing places in Tallinn and elsewhere in Estonia. Pene - the one I used is from Vilma, plastic bags with white dots on red (unless they've changed their packaging during last year). Joey - you can always try and report back if it did!